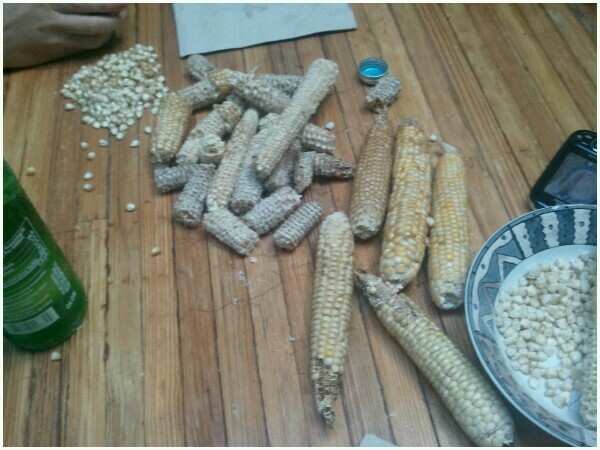 Yesterday Gary Nabhan brought us some Chapalote corn. This is one of the oldest corn varieties in the southwest. We wanted to see if we could turn this beautiful corn into a tasty and colorful polenta.But first we had to get all the kernels off the cob. Luckily Marco was there to help us. We ran it through the stone mill and Robbie turned it in to polenta. Beautiful color and taste! Posted on November 9, 2011 by Emma and filed under Blog and tagged 2011.